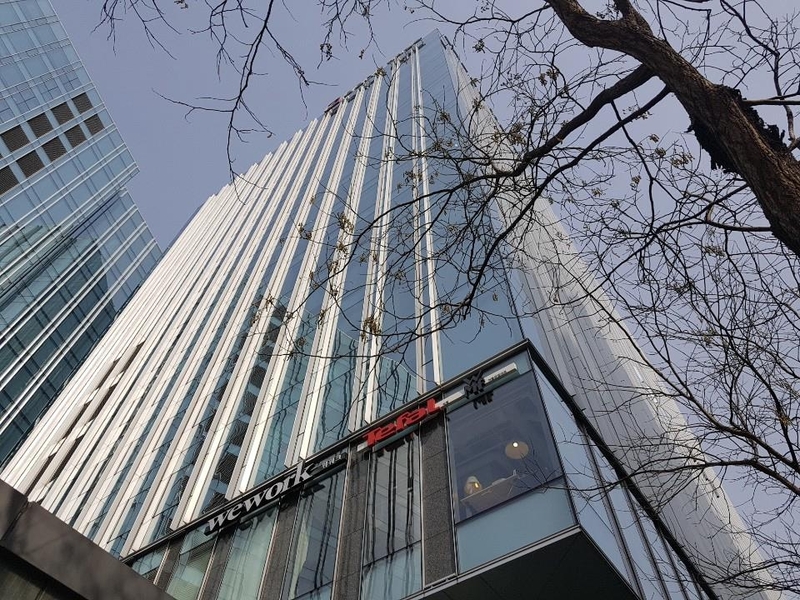 SEOUL, March 15 (Yonhap) -- Choe Joseph, a financial consultant at Murex Korea Ltd., loves that his new office is fully set up for him and his seven colleagues at a WeWork workspace in downtown Seoul. The Paris-based software developer for financial institutions moved to WeWork Jongno Tower in November 2018 under a multi-year contract with U.S. co-working space provider The We Company. "The facilities WeWork provides match the growing desire for more open workspaces. They provide tenants with many beautiful places (for) their jobs, so we're not tied to a single desk. Meetings can be done in a meeting room or casually in the lounge as if you were at a coffee shop," Choe told Yonhap News Agency in a recent interview. WeWork supports communities within their workspaces. "This makes our small office feel like a much bigger office full of interesting people. They often have events that can take your mind off work for 5 minutes, 30 minutes or one hour, which is a nice break and can reduce your stress level," he said. Murex is one of a growing number of clients using WeWork co-working space in South Korea, Asia's fourth-biggest economy. Beck Kim, chief executive officer of Space Oddity, said the local music content startup moved to WeWork Gwanghwamun two years ago. "Our 15 employees are always stimulated by hard-working people in other offices (at WeWork Gwanghwamun). Among other things, I was impressed by the caring staff here. They try hard to understand the tenants within their workplace and they try hard to improve conditions," Kim said. Kim Kwang-sik, group vice president of Limelight Networks' Asia-Pacific operations, said what differentiates WeWork from other serviced office rivals such as CEO Suite and The Executive Center is the well-established worldwide community networks. If a company has a WeWork membership, it can use most WeWork locations around the world. Membership costs start at 350,000 won (US$310) per month for a seat at WeWork. "If I go to Tokyo, I can use a WeWork office space at Tokyo Square Garden in Kyobashi once I book the space. It's really convenient for WeWork members on business trip since there is no hassle in trying to find a place to get the job done," Limelight's Kim said. Limelight, a U.S.-based digital content delivery service company, signed a one-year contract to use WeWork Gwanghwamun in July last year as its 16 employees were drawn to the space, services and amenities like coffee and beer that WeWork offered. WeWork entered Korea in August 2016 by opening its first operation in the affluent Gangnam area of Seoul. It plans to increase the number of locations in the country to 18 by July, allowing it to accommodate 24,000 people. In August 2017, WeWork announced it will invest $500 million in South Korea and Southeast Asia. The New York-based collaborative workspace provider said it will "definitely" continue to invest in Korea as the concept of a WeWork joint office space is being accepted by a growing number of individuals and small businesses. "WeWork allows any company of any size to work in great buildings in downtown Seoul at competitive prices. It is impossible for a small three-person startup to have office space inside landmark buildings like Jongno Tower, but this is possible for a WeWork member, making it an economical and very sensible option," WeWork Korea General Manager Matthew Shampine told Yonhap early this month. More than that, the community aspect makes WeWork members happy, resulting in better productivity, lower turnover and reduced costs, the general manager said. Critics of WeWork's business model said having so much exposure to real estate poses a real risk, as a market downturn in a country could lead to tenants there ending their leases with the company. "WeWork leases office spaces from local landlords and then leases them to individuals, startups and big companies that want to share office space on flexible terms. If WeWork fails to fill its space and to make a profit, its sustainable growth won't be possible," Jeong Yong-jei, a Mirae Asset Daewoo analyst, said. In spite of such possible risks, Shampine said Korea is "a great place for WeWork" as its society adopts "noble ideas" very quickly. WeWork, established in 2010, has advanced to 27 countries and secured over 400,000 members in 425 physical locations in 100 cities. Japan's Softbank is its largest investor. Most of WeWork's locations resemble high-end coffee shops, contemporary offices or fancy hotel lobbies. Amenities include free printers and Wi-Fi, comfy seating and kombucha taps. In Korea, established companies such as Samsung, SK and Lotte groups account for 25 percent of WeWork's total membership, with 15 percent being taken up by startups. It said lawyers, accountants, sales officers and promotions and marketing professionals make up much of the rest.